Tag Archives: invasive or not? Purist or Pragmatist? Identifying and Addressing Non-Native vs. Invasive Species in Prairies. Recently, there has been a lot of consternation and confusion among biologists and the public about invasive species. Much of the confusion comes from misusing the term “invasive species”, and particularly the practice of using the terms “non-native (or exotic) species” and “invasive species” interchangeably. This really needs to stop. In North America, non-native species are generally defined as species that were not present in an ecosystem prior to European settlement. There is plenty of discussion to be had about whether or not that is a useful definition, but there you go. While definitions of invasive species vary, most ecologists use a definition similar to that used by the National Invasive Species Informational Center, which has two important parts. First, the species must be non-native to the ecosystem in question. Second, and most importantly, a non-native species must either cause – or be likely to cause – harm to the environment or human health in order to be considered invasive. That ability of the species to cause harm when it’s been introduced into an ecosystem is the key characteristic that splits invasive species from all other non-native species. 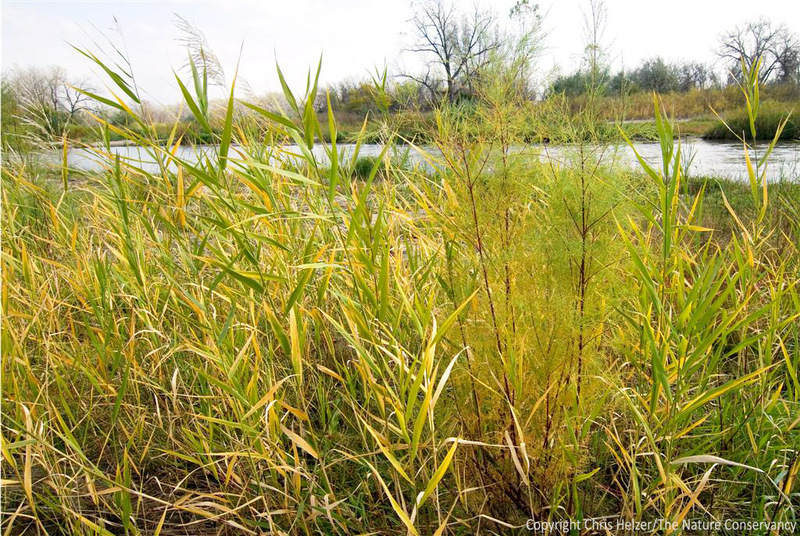 A third term often thrown into invasive species discussions is “weed.” The common definition of a weed is “a plant out of place” – meaning that any plant that shows up where someone doesn’t want it can be considered a weed. I don’t have any problem with that definition, but there are at least two problems that arise from using the term “weed” interchangeably with “invasive species”. First, of course, weeds can only be plants, and there are plenty of invasive species that aren’t plants. Second, because of the definition, a plant that is called a weed by one person might be a wonderful plant to the next. Lots of native perennial prairie wildflowers show up in weed books and websites, for example, because the authors of those sites see them as extraneous to pastures, yards, or other non-prairie habitats. Many other “weedy species” (native and non-native) are important components of prairies – temporarily occupying space abandoned by stressed perennial plants until those perennials recover from fire, grazing, or other disturbances. 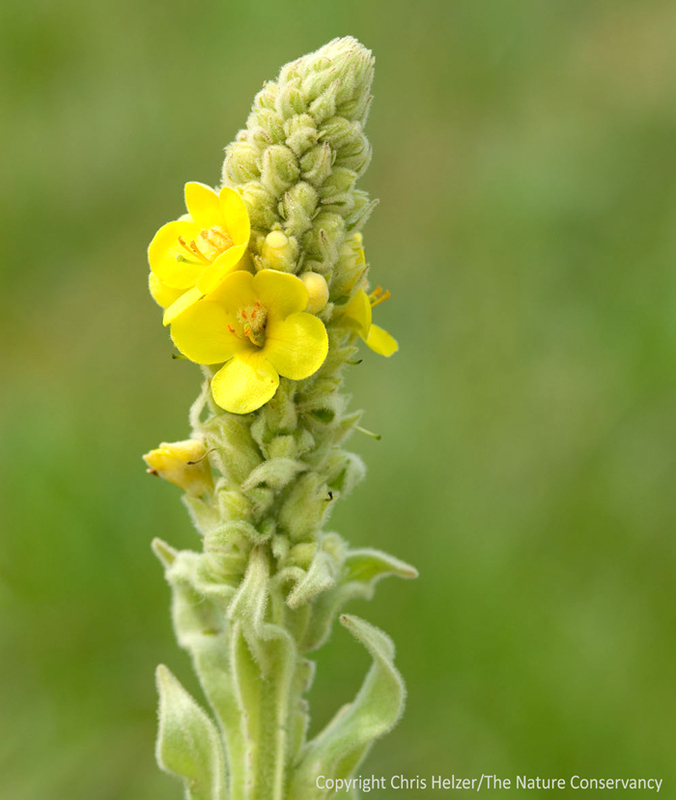 Common mullein (Verbascum thapsis) is a non-native plant considered to be invasive in some places, but not in Nebraska. In our Platte River Prairies it appears when dominant grasses are weakened, but doesn't persist when those grasses recover. Several high profile articles and opinion pieces have recently questioned the value of fighting against species simply because they are “non-native”. I think it’s a great topic of discussion, albeit one that makes many ecologists uncomfortable. However, some of the authors – and MANY of those who have subsequently reported on the original pieces – make the very dangerous error of interchanging the terms “non-native” and “invasive” as they discuss the topic. Even The Nature Conservancy’s Chief Scientist made this mistake in a blog post he wrote about a journal article by Mark Davis and his colleagues. Here’s the thing, it’s really easy for those of us working to conserve native ecosystems to become purists about the species we want in those ecosystems. We are fortunate in North America to have ecosystems that consist largely of the same species that were present in those systems at the time of European settlement. There are advantages to having ecological systems full of those “native” species because those species have had time to develop relationships and counterbalances with/to each other. However, very few ecological communities (none that I work with) remain completely devoid of non-native species, and keeping them “pure” gets harder all the time. Drawing a line in the sand and working to prevent any non-native species from getting a foothold in ecological communities is not only impossible, it’s foolhardy as well. As I consider whether or not a particular species is one to attack or live with, I focus mainly on the question of whether that species adds to, or subtracts from, the species diversity, ecological resilience, or ecological function of my prairies. Does the new species outcompete others to the point where small or large scale diversity declines? Or does the species actually increase species diversity by adding itself (and its functions) to the prairie? For example, I don’t worry about plant species like the biennial plant goatsbeard, aka salsify (Tragopogon dubious), even though it’s a non-native species. My experience with goatsbeard is that it periodically appears here and there in prairies – mainly where defoliation has weakened dominant grasses and opened space for the establishment of new plants. It certainly doesn’t appear to be eliminating other species or negatively altering habitat. Rather, it’s inserted itself into the plant community in such a way that someone who didn’t know better would assume it was native. 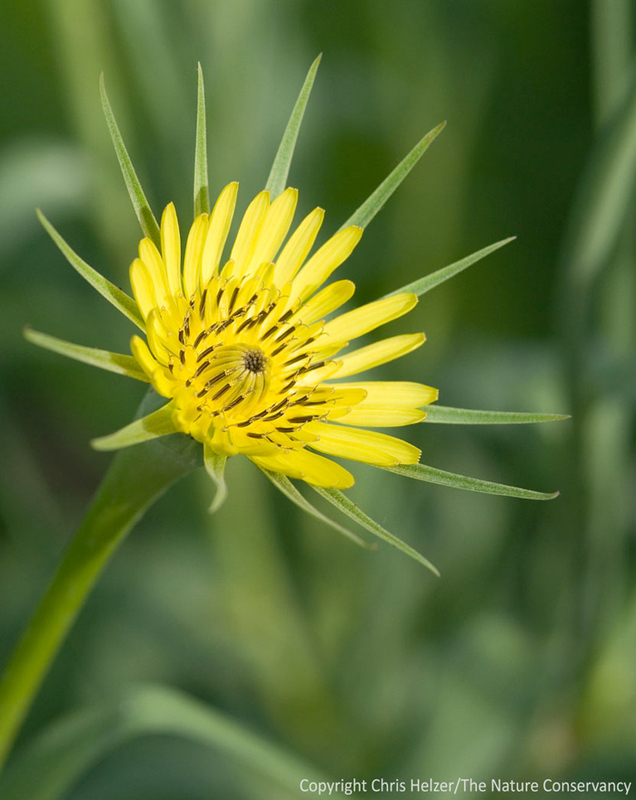 Goatsbeard, aka salsify, is a non-native plant species that doesn't appear to be invasive. In contrast, I worry a great deal about species such as crown vetch and smooth brome, because both can form large monocultures, and if left unchecked, can transform a prairie plant community into one dominated by only a few plant species. Not only does that affect the plant species pushed out of the community, it severely alters habitat conditions for pollinators and other species that rely on those now missing plant species. Further, it changes the habitat structure and food availability for many animals. We try to eradicate crown vetch as soon as we find it, because it’s not (yet?) widespread on our sites. We know we can’t eradicate smooth brome because it’s already all over the place, but we do design management strategies to suppress it when possible, and to encourage other plant species to fill space left by weakened brome plants. We also, by the way, suppress or kill native species that act aggressively and simplify either species composition or habitat structure. For example, eastern red cedars are native species that encroach upon prairies when fire is absent. We clear cedar trees that are too large to kill with fire, and use periodic prescribed fire to stop others before they grow very large. In addition, we use herbicides to kill many other native tree and shrub species, including honey locust, smooth sumac, rough-leaved dogwood, and many others when their presence works against our ecological goals for a site. Similarly, most of our fire and grazing management is designed to suppress the dominance of native warm-season grasses like big bluestem and indiangrass because those grasses can reduce plant diversity if given the chance. This eastern red cedar had a short life prior to our prescribed fire that killed it. 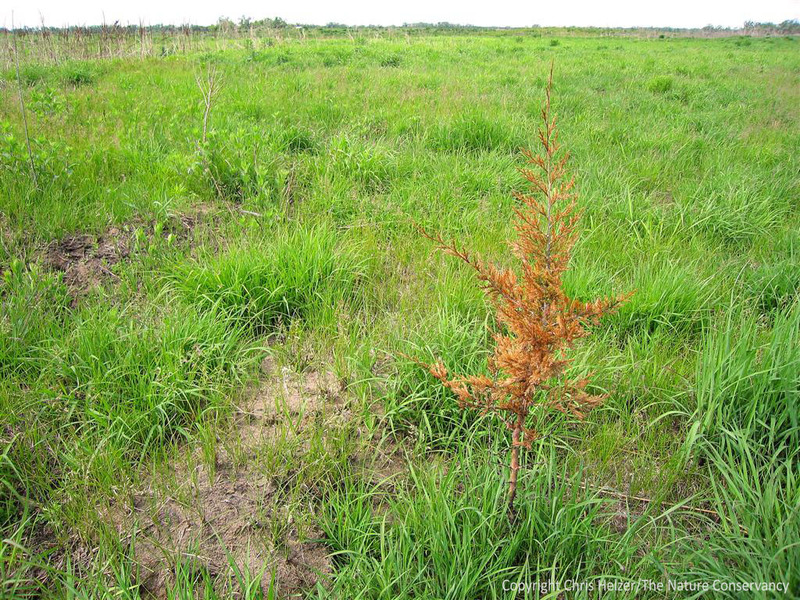 Cedars are native to Nebraska, but when left unchecked can drastically impact prairie habitats and species diversity. There are, of course, invasive and other non-native animals too – not just plants – but for the most part, prairies in our areas have few animal species that we know to be causing problems. There are a few invasive insect species that were introduced as biocontrol for invasive thistle species but subsequently began attacking native thistles – but I really don’t know much about them. However, a couple of non-prairie birds provide good examples of non-native vs. invasive animals. European starlings are non-native birds that are a substantial reason for the decline of native cavity nesting birds such as red-headed woodpeckers. Starlings, therefore, are invasive species. In contrast, Eurasian collared-doves are a new species of bird to Nebraska, but at least to my knowledge, no one has shown any reason to be concerned about that. Collared-doves may just be a new species of bird that has successfully joined the community of species in our towns (where they are usually found). There are, of course, some important differences between non-native invaders like crown vetch and smooth brome and native species like cedars and big bluestem. Those differences include a long history of inter-species competition that has built plant communities that are unlikely to allow any one species to become overly dominant – or that at least have the capacity to prevent that dominance under certain fire, grazing, or other conditions. Most successful invasive species are able to invade and dominate regardless of managment conditions, and require direct focused attack in order to control them. An additional difference is that with native species, we know what we’re getting. We have a pretty good idea of how they grow, how they interact with other species, and what factors give them an advantage or disadvantage within their communities. With non-native species, we don’t have that history to draw upon as we try to decide whether or not to control them. That uncertainty is a huge challenge for those of us who have decided not to be purists about native/non-native species, but to instead work against those species that decrease diversity and resilience. How do we know which new species will be problems? Sometimes we can use information from other land managers or published journal articles that have already evaluated species which are just showing up in our prairies. However, even in those cases, it can be hard to know for sure how a new species will act when it comes in. Varying soils and precipitation rates are just two of many factors that can lead to a species becoming invasive at one site and simply non-native at others. Sweet clover is a great example of a species that is considered to be an awful invasive species in some places and simply a big ugly non-native plant in others. I don’t like sweet clover, but I haven’t seen it decrease plant diversity over time at our sites. 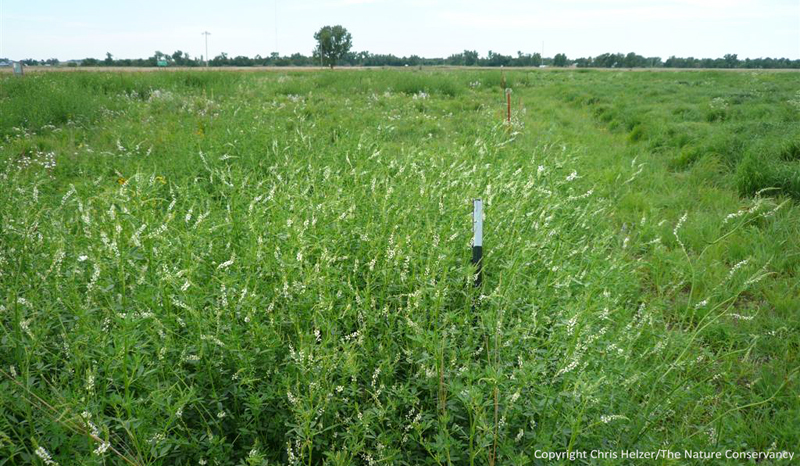 In prairies we manage with periodic grazing, sweet clover is largely a non-issue because it is so palatable to cattle. In our other prairies, it becomes visually abundant in some years and not in others, and the surrounding plant community seems to be just the same after a flush of sweet clover as it was before it. I’ve spoken to other prairie managers around the country who see sweet clover as I do, but I also know managers who see it acting much more aggressively. We’ve made the decision not to worry about sweet clover on our prairies, but I certainly don’t blame others who spend time and effort suppressing it. Sweet clover is a species that is considered by some to be very invasive, but we tend to think of it as a big ugly plant that comes and goes without lasting impacts. This is a photo I took this summer in some of our research plots where we are tracking sweet clover and other non-native species in high and low diversity plant communities. This kind of uncertainty about potential impacts creates an obvious conundrum. We can’t fight every new species that comes into our prairies, but we don’t always know which to focus on and which not to. Unfortunately, I don’t have any easy answers. We all have to make our own decisions based on the best available information and the amount of time/effort we can spare. For example, someone who owns a small prairie and has abundant resources might decide to prevent any new species from joining the prairie community to be completely safe. On the other hand, most of us are forced to make difficult decisions (guesses?) because our resources are very limited. Maybe the key is simply to be thoughtful. I think it’s a mistake to assume that a species is bad just because it’s new. Not only are some non-native species fairly innocuous, many can provide benefits, including food sources for native animals, replacement for eradicated native species, etc. However, it’s also a mistake to look at a few prominent examples of where non-native or invasive species turn out to provide unexpected benefits and assume that we should just accept all comers. The successful nesting of endangered southwestern willow flycatchers in riparian habitats dominated by invasive salt cedar, for example, has led some to suggest that maybe salt cedar isn’t so bad after all. This inaccurate, but frustratingly common, misreading of the situation ignores all of the damage to other aspects of the environment caused by salt cedar. Clearly, there are some species that need to be controlled at all costs before they completely wreck important native habitats. Salt cedar has been shown to be invasive, in that it has multiple negative impacts on the surrounding environment. Here it's growing in a patch of non-native Phragmites (common reed) - another invasive species. All of us who manage prairies have to make daily decisions based on best available information, past experience, and gut feelings. Decisions about invasive and other non-native species are really no different. I certainly don’t plant seeds of non-native plant species in our prairie restorations, but I also don’t worry about most of the non-native plants that establish there. Frequent conversations with other prairie managers help me keep track of which species are causing problems elsewhere, and that helps me make decisions about our sites. I’m sure I’ll make (have made?) mistakes about which species to worry about, but I hope that careful monitoring of those species and their interactions with the surrounding community will help me catch those mistakes early. I’d love to have prairies with only native species in them. I’d also love to have prairies with millions of contiguous acres, large herds of free-roaming bison, and staggering plant, insect, and animal diversity – along with a huge staff of well-trained and well-equipped land managers. Unfortunately, the reality is that I manage relatively small and fragmented prairies with a small staff and old equipment – and our prairies contain quite a few non-native species. I try to eradicate known invasive species as they appear, suppress the ones that are entrenched, and make smart decisions about species I’m unsure of. Anyone have a better plan? For those of you in Nebraska, there is a great invasive species site that contains current events, species lists, and other great information about invasive species. Visit the Nebraska Invasive Species Project site here.